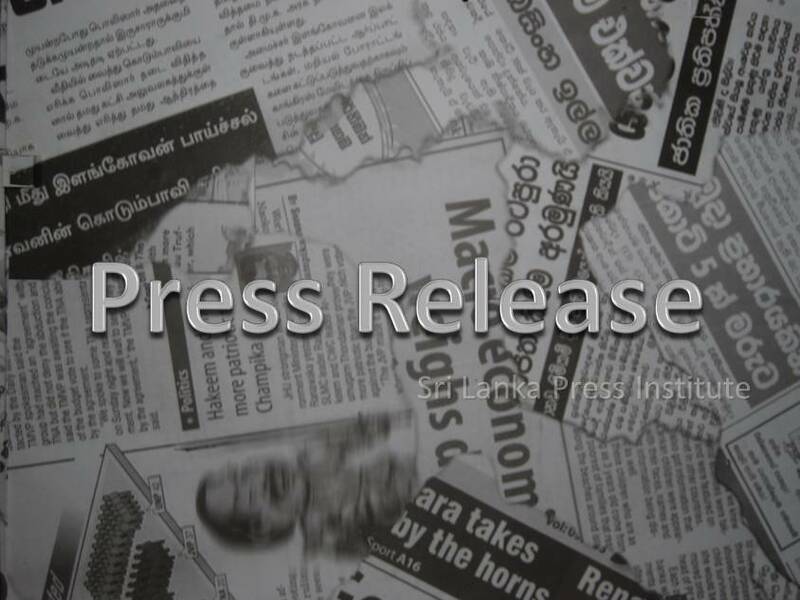 The Sri Lanka Press Institute welcomes the passage of the Right of Access to Information (RTI) Bill by unanimous vote in Parliament on Friday the 24th of June 2016. The SLPI, which comprises the Newspaper Society of Sri Lanka, The Editors’ Guild of Sri Lanka, the Free Media Movement, the Sri Lanka Working Journalists Association and affiliates viz., the Sri Lanka Tamil Media Alliance, the Muslim Media Forum, the Federation of Media Employees Trade Unions and the South Asia Free Media Association had long campaigned for this law beginning from the 1998 Colombo Declaration on Media Freedom and Social Responsibility. The 2003/2004 (then) Freedom of Information (FOI) Bill was drafted by a Committee chaired by the (then) Prime Minister Ranil Wickremesinghe which included former Attorney General, the late Mr KC Kamalasabeyson PC, then Justice Ministry Secretary Ms Dhara Wijetilake, the late Ms Sriyanganie Fernando of the Legal Draftsman’s Department, Mr. Sinha Ratnatunga (then) President of The Editors Guild, Mr. Waruna Karunatilake (FMM), Ms. Kishali Pinto-Jayawardena, legal adviser to The Guild and legal academic Mr Rohan Edrisinha. This Bill was the template of draft information laws that followed. In 2010, the SLPI participated in the revision of the 2004 FOI Bill initiated by then Justice Minister Milinda Moragoda. Later, Mr Karu Jayasuriya MP (now Speaker) introduced the 2004 FOI Bill as a Private Members Motion in 2010 but the motion to debate the Bill itself was defeated. In 2015/2016, Mr. Sinha Ratnatunga (Deputy Chairman, SLPI), Mr. Waruna Karunatilake and Ms. Kishali Pinto-Jayawardena represented the SLPI in the Drafting Committee which finalized the instant Bill under the Ministry of Parliamentary Reforms and Mass Media. The SLPI celebrates the passing of this long delayed Bill which secures an essential right for Sri Lankan citizens. This effort is to the credit of the present Government of National Unity given that the 2004 Bill approved by the Cabinet of the United National Party Government at the time could not be enacted due to the premature dissolution of that Parliament. Sri Lanka now becomes the one before the last country (Bhutan) in South Asia to pass an RTI Bill and ranks as the 108th country in the world in that regard. While appreciating the high rating awarded to the RTI Bill by international RTI rating agencies, the SLPI awaits clarifications on the amendments made to the Bill on the floor of the House on Friday. In particular, the SLPI records its reservation that the RTI Commission that is entrusted with the efficient implementation of this proposed law has not been provided with the required legal powers to enforce their decisions in a suitably expeditious manner. The SLPI strenuously supported the awarding of such powers on the Commission during the drafting process. The passing of the RTI Bill regardless, we face a most difficult task in challenging a long entrenched culture of official secrecy in the country. It is therefore hoped that ensuring the effective implementation of RTI will be a truly national effort pursued passionately in the interests of improved governance and political accountability in Sri Lanka.